Regenwald 2011 is a contemporary re-interpretation of David Tudor’s series of compositions from the 1970′s entitled “Rainforest”. It uses various types of sonic transducers to play live sounds through various resonant objects in the performance space, as well as through architectural features of the space itself. 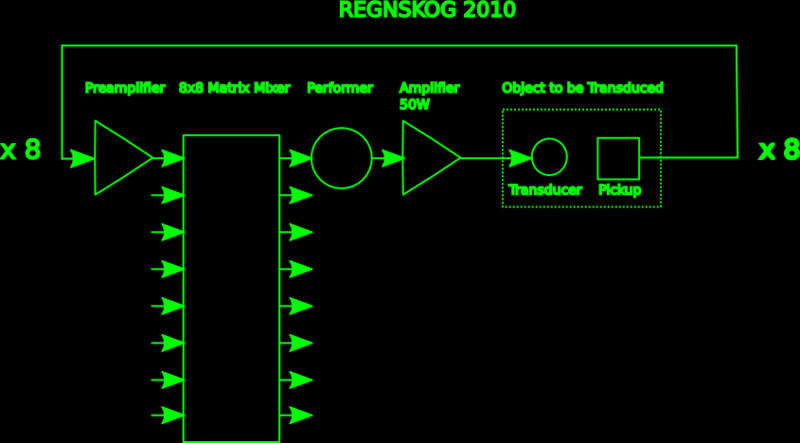 Additionally, an 8×8 matrix mixer allows the sound from any of the objects to be sent to any of the performers, making the whole piece an experiment in generative chaos. Regenwald 2011 will be developed in a workshop format with up to 8 participants over a period of several days. The resulting work should shift between relatively static installation-like moments and performative sections where the artists seek new relationships with the objects and each other. The audience is free to move around the performance space, engage in conversations and explore the resonant objects, thus adding new life to the rainforest. A opening night presentation will introduce the concept of Regenwald 2011 and the context of “Schematic as Score” as seen in the works of both David Tudor and John Cage. Danish sound artist and cultural producer Mads Bech Paluszewski (1977) works with circuit bending, sound installations, tactile acoustics and performances from his Copenhagen base. Solo and as a member of several groups of experimental audio/visual music and performance groups, he has performed at many Nordic music and sound art festivals. He has also held several workshops in circuit bending and user driven sound installations in Denmark. Regenwald is a join production of DISK/Club Transmediale and Tuned City/DOCK e.V. This entry was posted	on Thursday, December 23rd, 2010 at 20:36	and is filed under Announcement. You can follow any responses to this entry through the RSS 2.0 feed. Both comments and pings are currently closed.